Mayor Rahm Emanuel joined Motorola Mobility leadership at the public unveiling of the company’s global headquarters in downtown Chicago. 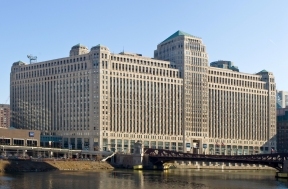 Motorola Mobility announced its relocation from Libertyville, Illinois to Chicago’s historic Merchandise Mart in July 2012. Motorola Mobility is one of 27 headquarters that has relocated to Chicago during Mayor Emanuel’s tenure and it will bring 2,000 jobs to the city. Motorola Mobility was founded in Chicago over 80 years ago and returns to the city after 38 years in Libertyville. The company is now the Merchandise Mart’s largest tenant and occupies more than 600,000 square feet on the top four floors and the rooftop. The building and the Motorola Offices are LEED Gold certified. The Motorola Mobility Foundation, the company’s philanthropic arm, has also awarded a generous $150,000 grant to the Chicago Public Library (CPL) Foundation, which will fund the CPL’s Maker Lab through June 2015. As the first free public maker space in Chicago, the Maker Lab at Harold Washington Library offers patrons an introduction to the latest technology and equipment that are enabling new forms of personal manufacturing and business opportunities. In November 2013, the Chicago Innovation Awards recognized CPL’s Maker Lab as an innovative new service product brought to public service.